The world's most notorious civic leader, besides Mayor McCheese. 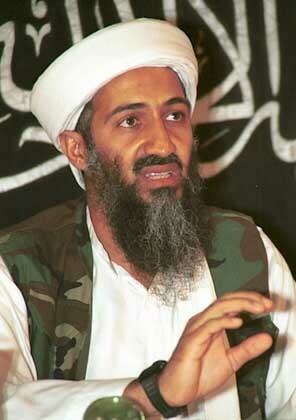 PESHAWAR, Pakistan -- Al-Qaeda leader and amateur short filmmaker Osama bin Laden has been captured after "checking-in" to a social networking application while visiting a butcher here. Foursquare gives badges and special offers for members who alert other users to their location, although the rewards are paltry compared to the $25 million bounty on bin Laden's head. "Mohammed's Quality Halal Meats gives you 10% off chickens if you earn a badge in Foursquare," said a disappointed bin Laden from aboard his secret US rendition flight. "I had already visited three times, so I was really close to earning it." U.S. authorities were alerted to the location of the wanted terrorist after he became Mayor of his Tora Bora cave, an honour bestowed on the most frequent visitor from any location. "I was so glad to be the Mayor," said bin Laden. "I even added it to my business card right under 'World's Most Wanted Man.'" Bin Laden said that, putting the application's role in his arrest and inevitable death sentence to one side, he is still equivocal about Foursquare. "It seems to be most useful when there are lots of users nearby," the Islamo-fascist mastermind explained. "And Foursquare seems not to have reached critical mass in the tribal areas of Pakistan yet. But it worked fantastically during my summer holiday in New York last year." Despite his general hatred of Western civilisation, Osama revealed he is an enthusiastic supporter of Web 2.0 technologies, especially social networking, which he described as a "welcome change from Al-Qaeda, which is an anti-social network." "For busy international terrorists on the run like me, Facebook is a great way to stay in touch with friends," bin Laden said. "Although I've found Facebook's privacy settings fairly problematic." While he prides himself on being an early adopter of both radical Islam and the latest technology, bin Laden says that even he has his limits. "Google Buzz is just ridiculously, incomprehensibly bad," he complained. "It makes me feel a bit redundant when Western civilisation seems intent on destroying itself like that. I'm also not huge on Twitter. 140 characters is a bit limiting when you're used to filming 40-minute diatribes denouncing your enemies." "Having said that, I do like finding out what is on Ashton Kutcher's mind," added bin Laden. "It reminds me why I started this jihad against America in the first place." Foursquare is now reporting that bin Laden has just been made Mayor of the Waterboarding Chamber at an unnamed CIA jail. This page was last edited on 5 June 2012, at 07:39.